The eschar represents the site of inoculation, where initial multiplication occurs before widespread dissemination. An eschar is typically painless and non-pruritic, and hence patient might not be aware of eschar. A thorough search for eschar is often rewarding. It clinches a diagnosis of scrub typhus, enabling early therapy. 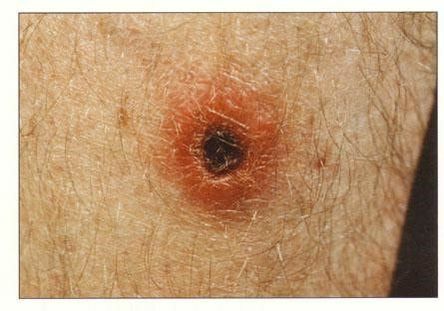 The lesion typically upto 1 cm in diameter,has a central tough black scab with slightly elevated dull red areola.It looks like a cigarette burn mark. The eschar resembling ‘cigarette burn mark’ is seen in 95% of cases and is most important diagnostic clue of scrub typhus. There was a significant difference in the distribution of eschars between males and females with a preponderance of the chest and abdomen (42.3%) among females and the axilla, groin and genitalia (55.8%) in males. Some unusual sites of an eschar were the cheek, ear lobe and dorsum of the feet.